A few days ago, I awoke to a noisy and bright electrical storm. These types of storms typically happen a few times a year here in Texas. I think they are awe inspiring, but am kind of afraid of them, because of the potential for flooding, fires, etc. The lack of control I feel over the elements is a little unnerving to me (I don't like swimming open water because of this, either). 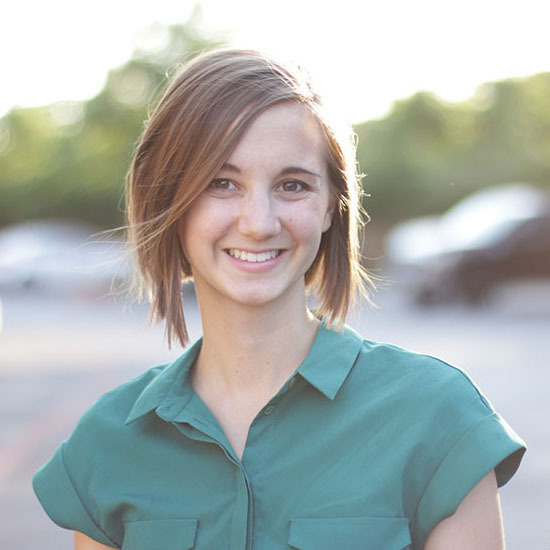 I am not a super control freak and can handle letting someone else take control for a little while, but I do like taking the reins back on my house and my life, and especially my kitchen. I have mega control in my kitchen. It is my domain, and Adam almost always asks before eating anything in the kitchen (sometimes I feel kinda bad about this, but mostly it is helpful, so he doesn't eat a crucial ingredient to dinner, which is why he usually asks first). Eating well has been a major priority for us for quite a few years now. We hardly ever have snacks around, because I try to provide 3 balanced meals a day, instead. Part of our food reformation has included eating way more vegetables (thanks CSA share! ), more seasonal fruit, and trying to buy organic as often as possible. Another place where I am learning to buy higher quality is in the spice and extract department. In the past, I tended to buy whatever was the cheapest, but often you end up with cheap quality, and your food is typically less flavorful for it (or your food tastes like dust because your spices are old). 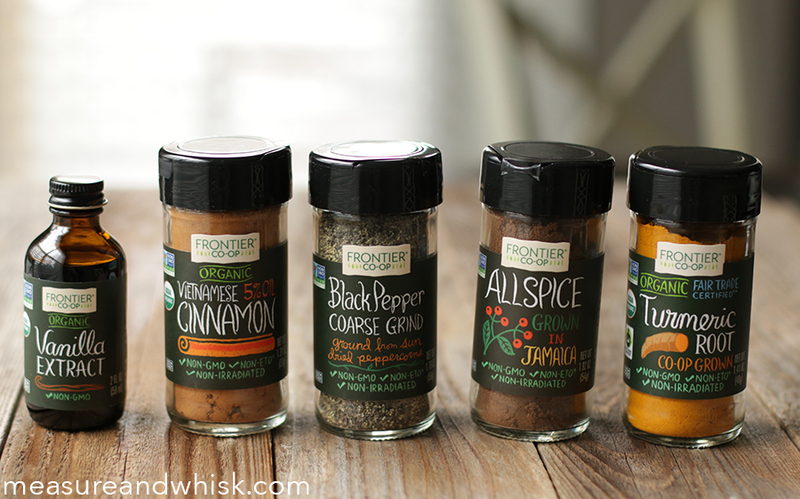 These Frontier Co-Op spices are organic, GMO free, and incredibly flavorful. I have used all of the spices in the photo below and was impressed by how good they were. They just added a lot to every recipe that I put them in (which has been a bunch, because these spices totally fit with my cooking). Check out Mambo Sprouts for more high quality food recommendations and recipes, and Frontier Co-Op for high quality spices and bulk foods! 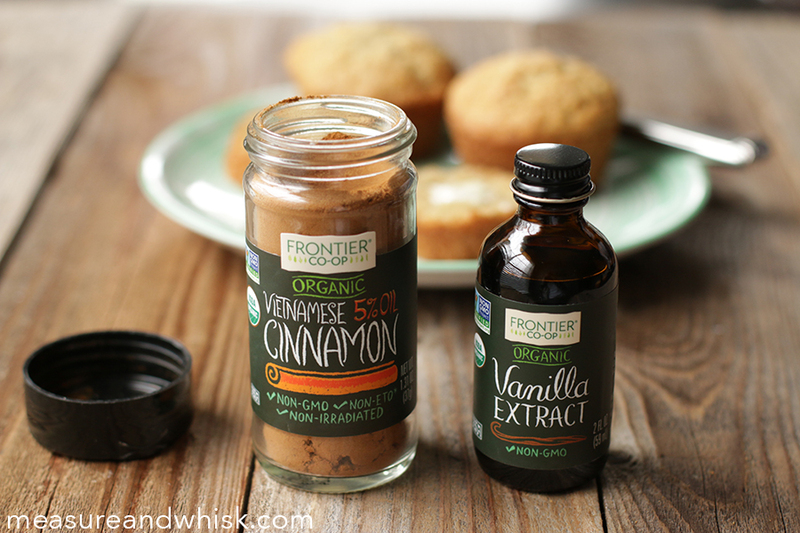 You can get $1.00 off your next Frontier Co-Op spice purchase with this coupon. 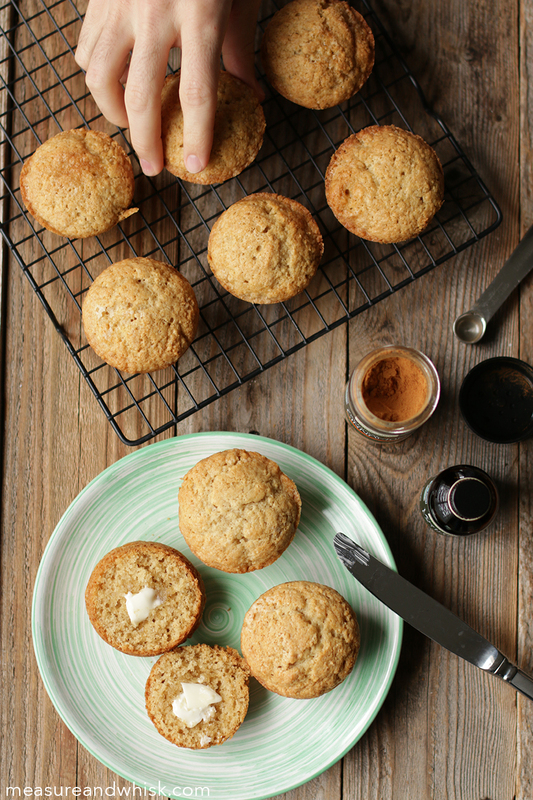 To make the muffins, combine the soft butter and sugar in a stand mixer and mix until fluffy and smooth. Add the egg, and mix some more. 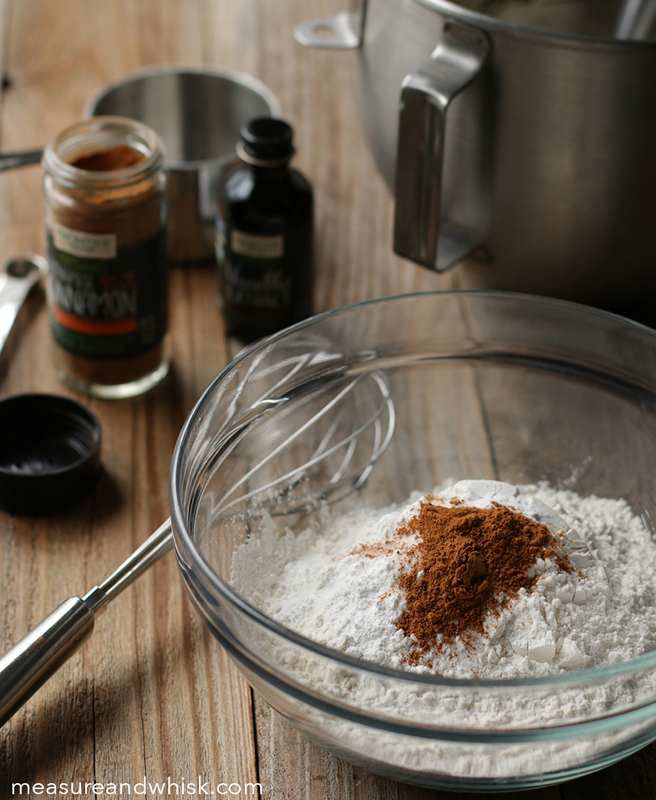 In a medium bowl, add flour, baking powder, baking soda, salt and cinnamon and mix to combine. In a measuring cup, pour the milk out, and then pour a little lemon juice over the top and let it stand for 2 minutes, until the milk has curdled. Add the half of the dry ingredient mixture to the stand mixer, and then add half of the lemon/milk mixture and the vanilla. Stir, then add the rest of the lemon/milk mixture and the dry ingredients. Preheat your oven to 350°F. 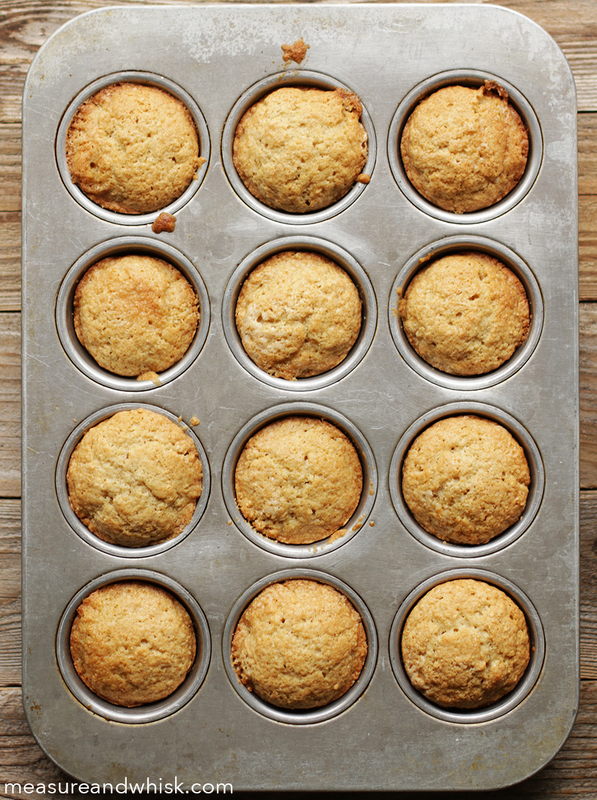 Grease a standard size muffin tin, and spoon out even amounts into each muffin well, until you have filled them all. Bake for 20-25 minutes, or until a knife or toothpick comes out clean. Remove them from the oven, wait about 5 long minutes, then carefully remove the muffins with a knife, to a cooling rack. Wait another 5 minutes or so, or enjoy immediately. Preferably with cinnamon honey-butter. To make the honey-butter, combine butter, honey, vanilla and cinnamon in a stand mixer and beat until fluffy. 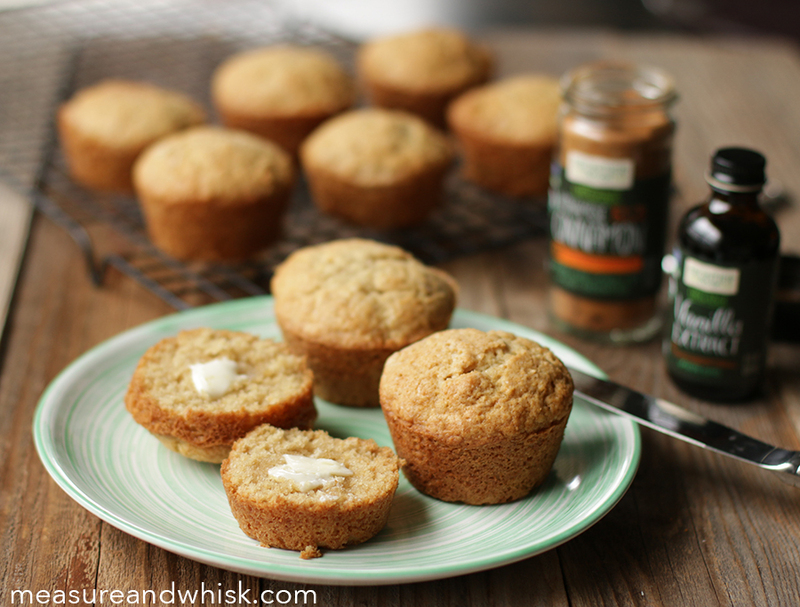 Feel free to leave out the cinnamon if you want a more versatile honey-butter. And the packaging is so pretty! That is always a big plus in my book! I saw this recipe and made them immediately! That warm muffin/cinnamon smell is so comforting on a chilly morning. Thanks! This makes me so happy! And yes, it is the most comforting smell! Nothing like warm cinnamon on a cold day! These sound so yummy! And the recipe has the benefit of using ingredients I basically always have on hand. These look great!! I love Frontier Spices. A great snow day recipe.